Prefectures across Greece are being supported to enhance their civil, geotechnical and environmental construction projects thanks to a series of seminars introducing them to new and innovative technical solutions. Local authority engineers and executives in Arta, Ioannina and Preveza had the opportunity to discover the latest advancements in rockfall protection, asphalt pavement reinforcement, hydraulic works and reinforced soil walls as part of a series of solution-focused seminars delivered by Maccaferri’s own engineers. 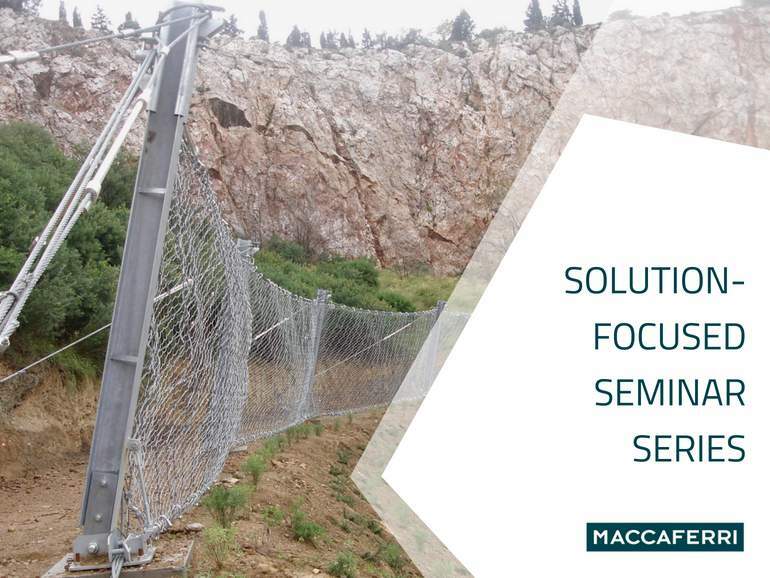 Local authorities in prefectures across Greece can book their own seminars to learn more about the most innovative civil engineering solutions by contacting Maccaferri directly. Participants in Arta, which is home to Arachthos, one of Greece’s major rivers, were keen to learn more about the key rockfall protection measures and hydraulic works that can support them to deliver future construction projects throughout the prefecture. Maccaferri’s revolutionary new Polimac coating also peaked participants’ interest as an alternative to PVC, especially when they discovered the significant economic and environmental benefits. Living in one the heaviest rainfall areas in Greece, participants in Ioannina gained insight into how Maccaferri’s rockfall protection solutions and retaining walls with gabions can be used to tackle slope erosion, which is a key problem across the prefecture. At the local department of the Ministry of Public Works in Preveza, participants were interested to learn about new rockfall solutions after last year’s earthquake led to major rockfall incidents on Leukada Island. Maccaferri’s rockfall materials, such as Steelgrid HR and rockfall barriers, can provide them with an effective way to solve this important issue. Participants from all prefectures showed a strong interest in pavement reinforcement solutions, as they are all looking to undertake significant asphalt pavement rehabilitation projects in the future. As a valuable partner, Maccaferri is now keen to support more local authorities across Greece by offering our expertise and insight to help them find high-quality, environmentally friendly solutions to their civil engineering problems. Local authorities are invited to contact Maccaferri directly to organise a seminar, tailored to their specific needs. To organise your own tailored seminar, or simply to find out more about Maccaferri and our solutions, please contact us.